These three excellent and complementary books will answer nearly every question that one might have about how the U.S. Army came to be entangled in fighting wars that it knew better than to fight in Iraq and Afghanistan. Counterinsurgency, COIN in U.S. Army lingo, is a kind of warfare best practiced at home where leaders care enough about the outcome to tolerate its horrors in order to prevail. Based on the hard earned experience of Vietnam and prior wars, the Army knew that COIN is a nightmare when its opponents have sanctuary, its local partners are both corrupt and incompetent, and its use of force is limited by qualms about killing civilians, innocent or not. 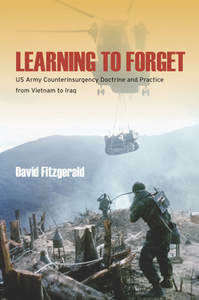 Fitzgerald, whose work began as a dissertation at University College Cork where he now teaches, provides a masterful account of the Army’s interpretation of its Vietnam experience. The Army has a preferred way of fighting, the American way of war that Russell Weigley and others have so well described, in which it overwhelms and destroys opposing forces with firepower, but it also has a can do attitude in which it accepts all of its assigned challenges, even the impossible ones, without much questioning. Despite claims to the contrary, the Army did not forget Vietnam or fail to understand its lessons. Vietnam wrecked the Army; there was no doubt about it. And, at least for a time, Vietnam also tempered greatly the interventionist urges of American politicians. Like the large and rational bureaucracy it is, the Army in the 1970s calculated the costs and benefits of maintaining much of its hard won counterinsurgency skills, of being good at these awful wars, and ran fast from the idea. Destroying Soviet tank armies tripping the World War III wire in Europe was what it wanted to do instead of mucking around in the Third World. And that is precisely what it was being told to do in the huge recapitalization of the American military that followed Ronald Reagan’s election as president. There was of course speculation by officers and historians, categories that occasionally overlap, about whether or not Vietnam could have turned out better. Some thought that had the Army followed its aggressive, war expansive, “crush them all” instincts it would have found victory. Others saw the opposite problem, the Army inviting defeat because it failed to implement fully counterinsurgency doctrine by remaining way too firepower oriented in a situation that required winning the support of the people and helping them develop their economy and political institutions. Still others believed that the large U.S. presence created dependencies that the South Vietnamese could never overcome. The Army, though, mostly wanted to move on. Counterinsurgency was a trap, and the way to avoid falling into it was to suppress interest in and any real capacity to conduct such operations. The Army made it clear that it was not much supportive of related concepts such as low intensity conflict, peacekeeping, military operations other than war, and humanitarian interventions popular as these concepts were among pundits, politicians and the occasional officer as the Cold War waned and then disappeared. Its preference was for the so-called Powell Doctrine which promised the application of decisive, overwhelming force in the pursuit of clear and popular goals, something that Vietnam never resembled. “Win rapidly and get the hell out” was the Army all-purpose war plan. And then came Iraq and Afghanistan. Secretary of Defense Donald Rumsfeld’s vision for the wars was not that different from the Army’s, except for requiring them to be more technologically focused and less manpower-intensive efforts. He wanted small American footprints and quick ends to both wars. But as Rumsfeld famously said, “Stuff happens,” and America was soon again entangled in counterinsurgency warfare. The burden fell mostly on the Army which hoped that it could avoid a repeat of its Vietnam experience by focusing on training locals to take the lead in providing security and basic services. It was not to be. Iraq slipped into a bitter civil war with American forces caught in the middle. And in Afghanistan the Taliban made a gradual recovery, as did the drug trade and government corruption. But the Army is a can do organization in which commanders are expected to demonstrate mission-directed initiative, no matter the obstacles. And, as Fitzpatrick makes us aware, the Army is followed into battle these days by an incredible number of staffers, advisors, consultants, commissions, contractors, and study groups, all seeking to describe its path to victory. It is a bureaucratic morass of policy entrepreneurs, the most successful of which was the group led by General David Petraeus who achieved media acclaim by defining counterinsurgency best practices to a supposedly resistant Army. 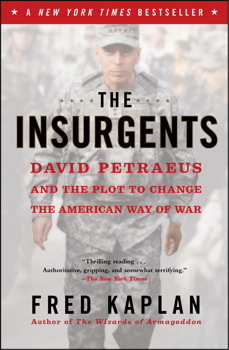 Fred Kaplan’s The Insurgents is a terrific account of Petraeus’ rise to national glorification as the savior of the U.S.’s apparent Iraq disaster, flawed human as he later turned out to be. Petraeus was the ambitious West Point cadet who married the Superintendent’s daughter, the hard charging general’s aide who ghost wrote the boss’ article on the need to deal with uncomfortable wars, the Army sponsored Princeton PhD candidate who chose to write but not publish on the Army’s Vietnam failure, the physical fitness fanatic who was able to survive disastrous training accidents, the division commander in Iraq who showed the value of restraint in coping with insurgencies, the doctrinal innovator who wrote the counterinsurgency manual, and the commander of all the wars who was willing to sacrifice official status to serve his country and President. Kaplan who is a MIT PhD and a columnist for Slate describes the intellectual foundations of Patraeus’ best practices for counterinsurgency and how Patraeus wooed the media, pundits, and academia in order to gain traction within an Army in which he was disliked for his self-promotion as much as his operational guidance. Kaplan provides insight into the organization as well as its leaders. For example, he shows how central the Sosh Department (the Social Science Department at West Point) has been in building the post-World War II Army, and how amazingly willing some in senior positions are to seek advice from sources outside Army. As sympathetically as he describes their efforts to win within the Army, Kaplan does not buy the COINdinistas’ arguments. The main weakness is one that many see—the flawed governments whose survival U.S. policy seeks to protect so far from home and, ultimately perhaps, from its own values and interests. It is true that the Army is often called upon to fight the uncomfortable wars, to try to stabilize countries that are ridden with irreconcilable political divisions and where its presence is as unwelcome as its motives are suspect. And because the U.S. lacks a colonial service, it is the Army that must not only fight the insurgents, but also try to make local populations believe that honest and effective government is possible. But the American public’s patience is limited. The good government mission most often takes too long to achieve leaving the U.S. to find a way out before the Army finds success. Colonel Gian Gentile, a Professor of American History at West Point, a Stanford PhD, and a Cavalry squadron commander in Iraq, offers what is essentially the Army’s answer to the counterinsurgency advocates, the cult of believers that formed around General Petraeus. He argues that they are basically dishonest, distorting the historical record to push a set of practices onto the Army that they assert have been proven as effective in previous campaigns, most especially in the much heralded British experience in Malaya. Gentile contends that the cultists have nothing to teach the Army which knows all it needs to about counterinsurgencies. When the Army’s counterinsurgency efforts fail, it is not for that lack of doctrine or skill, he believes, but rather for the lack of national interest and will. Instead of fighting better wars by following newly certified counterinsurgency best practices, the U.S. would be wiser to avoid what are inherently doomed fights—someone else’s civil wars. The books all come to the same place. Fitzgerald may have wanted to nail the Army for purposefully forgetting how to fight counterinsurgencies, but in the end he admits that the Army quickly adapted to the fight it had in Iraq and Afghanistan, and that the outcome is a political calculation of costs vs. benefits made by American politicians, not American generals. Kaplan is aware that counterinsurgencies are, as David Galula, the French Army officer who theorized about them, states, mostly political affairs. There is no lasting political deal among the Sunnis, Shiites, and Kurds in Iraq and corruption seems entrenched in Afghan society. Gentile wants the Army to come back to the American way of war. It seems likely that it will. Harvey M. Sapolsky is Professor of Public Policy and Organization, Emeritus at MIT and was until recently the Director of the MIT Security Studies Program. He has been a visiting professor at the University of Michigan and the U.S. Military Academy at West Point. In the defense field he has served as a consultant or panel member for a number of government commissions and study groups. His most recent books are US Defense Politics written with Eugene Gholz and Caitlin Talmadge and US Military Innovation Since the Cold War edited with Benjamin Friedman and Brendan Green. Also see Gian Gentile, “Counterinsurgency: The Graduate Level of War or Pure Hokum?” e-International Relations, 3 August 2013; available at https://www.e-ir.info/2013/08/03/counterinsurgency-the-graduate-level-of-war-or-pure-hokum/.